Please enter information in the form below to process registration for 2019 Roger Creager Coastal Bender Fishing Tournament. Please choose the division that you would like to participate in for the 2019 Roger Creager Coastal Bender Fishing Tournament. Upgrade your Roger Creager's Coastal Bender Fishing Tournament experience with upgraded SWAG and an Exclusive Coastal Bender Membership! Coastal Bender Membership: As a Coastal Bender Member you would receive special email offers on unseen upcoming events going on at the American Bank Center and with Gulf Coast Tournament Association before the public lays eyes on it. VIP Platinum Package: The Platinum Package includes Custom Tournament a Dri-Fit Shirt, Custom Hat, Koozie, and Bandanna as well as a Tournament Decal. This is a different shirt and hat than you will receive with the standard tournament registration. All rules stated below will remain in effect for the 2019 Coastal Bender Fishing Tournament. All decisions made by the tournament director and/or tournament officials will be final in all matters. The tournament director and/or the tournament officials can make a change when the safety of a contestant is in question or by a unanimous decision by the tournament committee. Any changes to the rules will be posted on the website, www.gctatx.com and communicated to the tournament members in the pre-tournament meeting before the tournaments and all platforms of social media.. Warnings, penalties and disqualifications will be determined by the tournament officials. A signature on one set of rules and regulations is applicable for any and all GCTA,SMG, American Bank Center, and City of Corpus Christi events and may be used as an acknowledgement for such. Each participant (“contestant”) must read and acknowledge the following rules and indicate so by signing an entry form. A “team” shall consist of one angler. 1)	Applicable Laws: Federal, State and Local laws shall be obeyed by contestants at all times. Contestants choosing to fish outside of Texas waters shall adhere to the local and state laws of the venue in which the contestant is fishing, including purchasing and possessing a valid fishing license for that state effective for the dates of competition. Violation of any federal, state and/or local laws shall result in the disqualification of the individual and his team from the Coastal Bender Fishing Tournament event, and may disqualify (at the discretion of the event’ officials) the individual and his team from the entire series. 2)	Tournament Eligibility: Contestants under 18 years old must fish with their legal guardian, or another adult approved by the minor’s legal guardian. The tournament officials reserve the right to refuse membership and participation in any event to any individual and/or team at the discretion of the tournament committee. 4)	Sportsmanship: Coastal Bender tournament participants are expected to follow the highest standards of sportsmanship, courtesy and ethics. Unsportsmanlike and unethical conduct will result in disqualification (at the tournament committee’s discretion). Please refer to the Federal & Texas Boating Safety Rules. 5)	Permitted Tournament Fishing Waters: Bay Fishing Contestants may fish in any inshore public water accessible by boat, or car “Inshore” for this series is defined as the navigable, tide consumable coastal waters, bays, rivers, and wetlands, extending to the inside of the passes to The Gulf of Mexico. Contestants may not fish beyond the furthest point of a pass extending into the Gulf of Mexico. Contestants fishing the bay side may fish from boat, by car are walk in and Kayaks may fish inland bay shorelines or inland bay piers. Bay fishing Division anglers are not allowed to fish on any beach front or shoreline that is touching the Gulf of Mexico. No fishing is allowed within 300 yards of tournament site. No fishing is allowed within 500 yards of any ferry landing. Contestants shall not fish in any area which has been “closed” by a governmental agency. Participants are not allowed to fish within 150 feet (50 yards) from another tournament angler unless they are invited in to the tournament anglers area. If a tournament angler invites another tournament angler into the inviting tournament anglers 50 yard area, any tournament participant is also allowed within the waived area. The tournament angler in an area first has the right to 150 feet radius of the area. 6)	Permitted Fishing Methods: All tournament fish shall be taken by rod, and reel. Prior to and during the tournament, contestants shall not “cork” or otherwise mark fish or schools of fish for identification for the purposes of locating fish during tournament hours. Wade-fishing is allowed. A wade-fisherman must net his own fish. 7)	Tackle and Equipment: Any bait can be used by a tournament angler. Only one rod and reel may be used at any one time per angler. 8)	Bay Division Fish: All fish will follow Texas and Federal Laws on each species. Each tournament angler is allowed to bring 1 of each species listed below up to scales. After tournament angler brings fish to scales anglers will not be allowed to return to vehicle to retrieve other fish. Listed below are categories for weight and documentation. Speckled trout : 15in. minimum length 100 pts. Red Drum: 20in. minimum and up to 28in. (Legal slot red) 100 pts. Black Drum: 14in. minimum and up to 30in. 100 pts. Flounder: 14in. minimum length. 100 pts. Gaff Top: 14in. minimum length. 100 pts. 8)	Permitted Tournament Fishing Waters: Contestants may fish in any inshore public water accessible by boat. "Inshore" for this series is defined as the navigable, tide consumable coastal waters, bays, rivers, and wetlands. Kayaks must be launched at a public launch accessible to the general public. You may not launch from private property (including your personal water front property), or any other place that requires "special permission". This is an inshore tournament only, you may not fish the surf, jetty's or any beach front. Contestants may not fish areas designated as private or “off limits" by federal, state and/or local law. Off limit areas include all FEDERALLY PROTECTED AREAS. If you drag, float, or are around a weir, dam or barrier to gain access to an off limit area, you will be disqualified. You may drag over public land in a marsh lake area to access the same public areas. Contestants shall not fish in any area which has been "closed" by a governmental agency. Wade fishing is allowed, but all contestants must stay tethered to boat while wading. Teams must stay within eyesight of one another. PFD’s must be worn at all times during tournament hours. 9)	Permitted Fishing Methods: All tournament fish shall be taken by rod, reel, and artificial tackle, only. Contestants shall not “harass" Fish prior to and during the tournament, contestants shall not "cork" or otherwise mark fish or schools of fish for identification for the purposes of locating fish during tournament hours. Wade-fishing is allowed as long as angler stays tethered to Kayak. 10)	Checkpoints: Official DROP A LINE times will be announced at the captains meeting and on Facebook on the Coastal Bender page the night before event (safe light anglers) . Official time will be made at captains meeting which is mandatory for 1 team member. It is the contestant’s responsibility to know his, official tournament time and check-in time. Once an angler has checked in, that angler will not be allowed to return to fish during the day’s competition and that anglers day of fishing shall cease. Check-in times will be between 3:00 PM and 6:00 PM. Contestants who are not at the official checkpoint area at the appointed time will be penalized at the rate of one-half (1/2) pound, per minute, which will be deducted from the team’s total day’s weight. Any contestant more than fifteen (15) minutes late will be disqualified from that day’s weight entry. Teams who are not able to check in due to equipment failure or other unforeseen circumstances are responsible for contacting the tournament director before the official check-in is over in order to determine an acceptable solution. 11)	TACKLE AND EQUIPMENT: Any bait can be used by a tournament angler. Only one rod and reel may be used at any one time per angler. kayak, canoe, hybrid kayak, paddle or peddle craft only…no motors. All kayaks must be physically launched. You may not ferry your kayak (the use of a motorized vehicle or boat to transport your kayak on water or land once launched.) You are allowed to do a one way. This is parking a vehicle at your starting point and working your way to your other vehicle at your takeout spot. You are not allowed to do a one way unless you are fishing with another registered angler in the Coastal Bender Event. 12)	Fish: All fish will follow Texas and Federal Laws on each species. Each tournament angler is allowed to bring 1 of each species listed below up to scales. After tournament angler brings fish to scales anglers will not be allowed to return to vehicle to retrieve other fish. Listed below are categories for weight and documentation. No altered or mutilated fish will be accepted. all species of fish will be inspected for alterations in size, length and weight. Any altered fish shall result in the disqualification of the team weighing the altered fish, and may result in a perpetual ban from the Coastal Bender Fishing Tournament. Plus will be turned in to local Texas Parks & Wildlife Agency. 13)	Permitted Tournament Fishing Waters: All anglers and boats participating in the Coastal Benders Offshore division must observe and obey all State and Federal fishing regulations also no angler is allowed to enter the water unless it is only for emergency repairs to bottom of hull or transom. Gulf of Mexico is your permitted fishing waters for this Coastal Bender event. 14)	Permitted Fishing Methods: All tournament fish shall be taken by manual rod, and reel. Prior to and during the tournament, contestants shall not “cork” or otherwise mark fish or schools of fish for identification for the purposes of locating fish during tournament hours. During Coastal Benders event any bait can be used live or dead as long as it follows State & Federal Law guidelines. Anglers will be allowed to catch bait while waiting for their designated time to break the jetty system they are leaving from. 16)	Tackle and Equipment: Any bait can be used by a tournament angler. All rods and reel used by contestants in the Offshore division of the Coastal Bender event must be manual, nothing electric. 17)	Offshore Division Fish: All fish will follow Texas and Federal Laws on each species. Each tournament angler is allowed to bring 1 of each species listed below up to scales. After tournament angler brings fish to scales anglers will not be allowed to return to vehicle to retrieve other fish. Listed below are categories for weight and documentation. No altered or mutilated fish will be accepted. A ll species of fish will be inspected for alterations in size, length and weight. Any altered fish shall result in the disqualification of the team weighing the altered fish, and may result in a perpetual ban from the Coastal Bender Fishing Tournament. Plus will be turned in to local Texas Parks & Wildlife Agency. 18)	General information: All contestants must have a Texas fishing license and appropriate federal permits, if needed. Weigh station will open at 3:00 pm till 6:00pm each day. All fish must be in edible condition. A Coastal Bender Official must weigh and measure all tournament fish entries. Gaff hook marks are not considered mutilation. Firearms, Bang sticks, Spear Guns, or Harpoons may not be used on any fish. Contestants may fish aboard any vessel as long as all tournament rules are followed. This includes private boats, charter boats, and party (head) boats. NOTE: Fish which have a minimum or maximum size limit will be disqualified if, in the judge’s opinion, the head or tail has been altered or damaged and cannot be measured or weighed accurately. All fish must be caught on a single rod and reel using bait and hooks or lures and hooks. Coastal Benders encourages all contestants to practice catch and release with fish that are not in contention for a trophy.Coastal bender Officials decisions will be final in all cases and all contestants are subject to a polygraph test if deemed necessary by Coastal Bender Officials. 19)	Permitted Tournament Fishing Waters: Kayaks must be launched at a public launch accessible to the general public. You may not launch from private property (including your personal water front property), or any other place that requires "special permission. Contestants may not fish areas designated as private or “off limits" by federal, state and/or local law. No ferrying kayaks to spots with other vessels. PFD’s must be worn at all times during tournament hours. Participants are not allowed to fish within 150 feet (50 yards) of another anchored boat unless they are invited in by the angler. An anchored boat is a boat held in a stable position by an anchor, a weight, push pole, PowerPole, or other "anchoring" mechanism. If angler invites another team into the inviting team’s 50 yard area, any tournament participant is also allowed within the waived area. Range finder and picture of boat behind range finder best way to bring this sort of protest to light. The boat anchored in an area first has the right to 150 feet radius of the area. 20)	Permitted Fishing Methods: All tournament fish shall be taken by rod, reel, and any bait that is legal and follows Texas and Federal Laws. Contestants shall not "cork" or otherwise mark fish or schools of fish prior to or during the event for identification, for the purposes of locating fish during tournament hours. Kayaks shall not have motors of any kind. No electric reels. No diving from your kayak to spear a fish, this is a fishing tournament, not a spearfishing tournament. Boats can not chum for kayakers but kayakers may chum for themselves out of the kayak. 21)	Checkpoints: Official DROP A LINE times will be announced at the captains meeting and on Facebook on the Coastal Bender page the night before event (safe light anglers). Official time will be made at captains meeting which is mandatory for 1 team member. It is the contestant’s responsibility to know his official tournament time and check-in time. Once an angler has checked in, that angler will not be allowed to return to fish during the day’s competition, and that anglers day of fishing shall cease. Check- in times will be between 3:00 PM and 6:00 PM. Contestants who are not at the official checkpoint area at the appointed time will be penalized at the rate of one-half (1/2) pound, per minute, which will be deducted from the team’s total day’s weight. Any contestant more than fifteen (15) minutes late will be disqualified from that day’s weight entry. Teams who are not able to check in due to equipment failure or other unforeseen circumstances are responsible for contacting the tournament director before the official check-in is over in order to determine an acceptable solution. 22)	Boat Regulations: Each vessel must have all required U.S. Coast Guard safety equipment. Plus any safety equipment the state requires for kayakers. No motors will be allowed everything is to be self propelled. The use of a motorized vessel is prohibited to ferry kayaks to fishing grounds. All kayakers must be self propelled. 24)	TACKLE AND EQUIPMENT: Any legal bait can be used by a tournament angler. Only one rod and reel may be used at any one time per angler. Kayak, canoe, hybrid kayak, paddle or peddle craft only…no motors. All kayaks must be physically launched. You may not ferry your kayak (the use of a motorized vehicle or boat to transport your kayak on water or land once launched. You are not allowed to do a one way unless you are fishing with another registered angler in the Coastal Bender Event, then you are allowed to do a one way. This is parking a vehicle at your starting point and working your way to your other vehicle at your takeout spot. You are not allowed to do a one way unless you are fishing with another registered angler in the Coastal Bender Event. 25)	Fish: All fish will follow Texas and Federal Laws on each species. Each tournament angler is allowed to bring 1 of each species listed below up to scales. After tournament angler brings fish to scales anglers will not be allowed to return to vehicle to retrieve other fish. Listed below are categories for weight and documentation. No altered or mutilated fish will be accepted. all species of fish will be inspected for alterations in size, length and weight. Any altered fish shall result in the disqualification of the team weighing the altered fish, and may result in a perpetual ban from the Coastal Bender Fishing Tournament. Plus will be turned in to local Texas Parks & Wildlife Agency. Gaff hook marks are not considered mutilation. Firearms, Bang sticks, Spear Guns, or Harpoons may not be used on any fish during the Coastal Benders Event. 26)	Tackle and Equipment: Any legal bait can be used by a tournament angler. All tournament fish must be caught by human powered rod and reel. No gigging, seine nets, spearing, cast nets, gill nets, or gaffs may be used to capture tournament fish or to aid in landing tournament fish. A rope can be used to aid in the landing of a catch, only when looped around the tail of the catch. A landing net may be used to land a non-shark catch. 27)	Beach/Surf Division Fish: All fish will follow Texas and Federal Laws on each species. Each tournament angler is allowed to bring 1 of each species listed below (EXCEPT SHARKS, NO SHARKS BROUGHT TO SCALES) up to scales. After tournament angler brings fish to scales, anglers will not be allowed to return to vehicle to retrieve other fish. Listed below are categories for weight and documentation. Sharks will be a video/picture release with the item of the day in your video. Shark release information and rules will be below. Picture/Still photo: Must be HD picture with the object of the day in photo with said angler . The shark Ruler must be 90 degrees in photo with whole shark in photo. See Example below. Must be squared to fish and tail straight. Angler must make sure person taking photo understands objective of them getting proper photo. If photo is not exactly like photo in example below, anglers catch will be disqualified. Correct method of using the shark board for official picture and video. Coastal Benders Shark Anglers video, will start with angler & object of the day shown with entire shark in video with the angler. Video will show Angler and object of day, shark board, anglers ruler starting at the Tip of nose with shark as straight as can get with it visible and clean. Anglers ruler will be held in a straight line with video showing clearly. Starting from nose angler lays ruler over top of shark touching or close as angler can get to top fin to fork plus tip length all easily visible on video, again with ruler being straight do not follow curvature of shark. Length logged in by by angler must be verified in video clearly. The tip length must also be shown clearly on video with ruler being straight from nose to fork, plus nose to tip of top fin. All measurements must be shown on anglers video/photo clearly and visibly, no questions asked. Nose to fork ,start to finish on each measurement with object of the day exposed in all videos. Hold shark board tight just above body of shark in a straight line, do not follow contours of shark. Total length is measured in a straight line from the tip of snout to the longest length of tail. This is longest length of fish which will be on log sheet for each day. Video must match log sheets. Sharks will have their own champion of this division which will come from longest shark caught and released. 28)	Checkpoints and Inspection: Each tournament will have designated checkpoints.. The checkout point and times will be communicated to the angler at the pre-tournament (“captain’s”) meeting. It is the tournament anglers responsibility to know his, official tournament time and check-in time. Failure to go through the checkpoint will result in disqualification. Once a tournament angler has checked in, that angler will not be allowed to return to fish during the day’s competition and that team’s day of fishing shall cease. Check-in times will be between 3:00 PM and 6:00 PM. Contestants who are not at the official checkpoint area at the appointed time will be penalized at the rate of one- half (1/2) pound, per minute, which will be deducted from the team’s total day’s weight. Any contestant more than fifteen (15) minutes late will be disqualified from that day’s weight entry. Teams who are not able to check in due to equipment failure or other unforeseen circumstances are responsible for contacting the tournament director before the official check-in is over in order to determine an acceptable solution. 29)	Polygraphs: By signature on the official tournament entry form, each contestant agrees to submit to a polygraph test and be bound by its interpreted results and conclusions. Polygraph tests may be issued at the discretion of the tournament director/ committee for any reason, and each contestant hereby acknowledges and consents to the examination. The results and interpretations of the polygraph are final and each contestant hereby knowingly, intelligently and voluntarily waives any review of said test result, including any judicial process seeking to overturn, amend or otherwise negate the finding of the test administrator. 30)	Insurance and Liability: The Coastal Benders event will not issue liability coverage for its events. A current copy of the anglers signed DECLARATION, WAIVER, RELEASE, AND HOLD HARMLESS AGREEMENT shall be given to Coastal Bender tournament staff before a team may compete in any Coastal Benders event. All tournament participants are required to sign a waiver absolving all tournament officials, officers, participants, sponsors and co-sponsors from any responsibility for damage or personal injury sustained as a result of the contestant’s participation in the tournament or its related activities, and the contestant’s signature on this form shall constitute in an alternate release in the instance the member fails to sign the official DECLARATION, WAIVER, RELEASE, AND HOLD HARMLESS AGREEMENT. 31)	Pre-Tournament “Captain’s” Meeting: Late Tournament Registration for the Coastal Bender 1st Annual fishing tournament will be the Thursday evening before the tournament date between 5:00 PM and 6:30 PM. A pre-tournament meeting will be held following registration at 8:00 PM. Captains Dinner is mandatory. Participants may be excused from the Thursday night meeting if arrangements are made with the GCTA or Coastal Bender Tournament office. 33)	Entry Fees, Tournament Registration and Identification: The entry fee for the event is $199.00 per angler, before June 1st, 2019 this is early bird sign up. Entry after June 1st 2019 will be $250.00 per angler. Late entry will start July 16th 2019 up until the night of Captains meeting. Late entry fees will be a total of $300.00 All entry fees are non-refundable. Entry fee into tournament per angler includes: V.I.P access to all Dinners, concert plus event access while Coastal Benders Event is happening. 34)	Boaters: All boat anglers participating in 1st Annual Coastal Benders Fishing Tournament must have all required U.S. Coast Guard safety equipment. The kill switch device must be attached to the driver's body anytime the combustion engine is operating on any boat. Anytime the combustion engine is operating and in gear, there must be a driver in the driver's seat in full control of the boat. Any additional fuel used during the tournament day must be purchased from a retail facility open to the public. 35)	Safety: Safe boating will be observed at all times. Each contestant is required to have a U.S. Coast Guard approved, personal floatation device. Tournament days may be shortened or canceled due to unsafe weather or water conditions. The decision to shorten or to cancel will be left totally to the discretion of the tournament director/ committee. A 4-hour period shall constitute a day of fishing. It is the competitor’s responsibility to communicate with the Tournament Director if cancellation of the event is suspected. Cancellations will be communicated via VHF radios on a channel decided at the Pre-Tournament Meeting. If conditions are not safe on the tournament day, the GCTA reserves the right to reschedule the tournament on the following day (Sunday). If conditions are not favorable the following day (Sunday), an alternate date will be published on the GCTA website plus all platforms of social media. 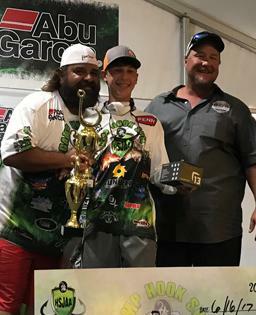 36)	Scoring & Awards: Tournament standings, auxiliary awards and final winners shall be determined by the total weight of each tournament anglers catch during the tournament, measured in pounds and 100 th of a pound. Fish may not be brought to weigh-in on a stringer or in a basket. Fish shall be weighed with the equipment provided by the GCTA staff member. Each species of fish will have awards for 1st, 2nd & 3rd place trophy with a big fish pot plaque for each species category. Grand Champion Awards will consist of total points of all fish brought to scales from each anglers weigh in totals. Accumulated fish points will be added together to make each anglers Grand Champion total points we will Award Grand Champion, Champion, 1st Runner -up, and 2nd Runner up. Every angler will have a Grand Champion Points if an angler has just 1 species or all 5 species. 37)	Ties: If two or more anglers have identical weight in the tournament, it will be considered a tie. In the event of a tie, the prize/pot money from the consecutive places will be combined and split between the teams. For example, if two anglers tie for fourth place, the amounts designated to fourth place AND fifth place will be combined, divided by two, then distributed to the anglers equally. In Grand Champion points race for the overall grand Champion a tie will be decided by first team that weighs in on day 2 in case there is a tie in points for Title of Grand Champion, Champion, Runner Up & 2nd Runner up awards. 38)	Protest Procedure: All protests must be submitted in writing, along with a $100 cash deposit. Protests must be submitted to the tournament director no later than 15 minutes following the weigh-in of the last fish. All decisions will be made by the tournament director and committee, and are final. If the protest is upheld, the cash deposit will be returned to the person submitting the protest. The protester agrees that by filing a protest, he may be subject to a polygraph test. 39)	Permission to be filmed and photographed & additional waiver : All participants agree to be filmed, photographed, taped, interviewed, quoted or otherwise revealed, without compensation, by the GCTA, Coastal Benders staff or its assigns. This includes but is not limited to the official photographers, writers, hosts, or sponsors of this event under the conditions authorized by the Coastal Bender Tournament organizers. Each contestant, by his signature affixed below, hereby gives the GCTA, and its assigns, the right to use (without compensation) the contestant’s name, picture, likeness, quotes, and biographical information, whether audio or visual, before, during and after the period of an individual or team participation in an event. DECLARATION, WAIVER, RELEASE, AND HOLD HARMLESS AGREEMENT shall be given to Coastal Benders tournament administrator before an angler may compete in any COASTAL BENDERS event. All tournament participants are required to sign a waiver absolving AMERICAN BANK CENTER, SMG MGNT., GCTA, Fox Yacht Sales, CITY OF CORPUS CHRISTI and all tournament officials, officers, participants, sponsors and co-sponsors from any responsibility for damage or personal injury sustained as a result of the contestant’s participation in the tournament or its related activities; however, the language of the waiver is incorporated herein for all purposes, and the contestant’s signature on this form shall constitute an alternate release in the instance the member fails to sign the official. DECLARATION, WAIVER, RELEASE, AND HOLD HARMLESS AGREEMENT. 1. That the vessel or vehicle that I am using in the EVENT has an active, valid liability insurance policy applicable to the boat owner, vehicle , passengers, or other third parties injured as a result of any mishap involving the vessel or vehicle. 2. That the act of traveling in and fishing by use of a boat or any other means in tournament situations often times presents dangerous circumstances, including, but not limited to traveling at high rates of speed; exposure to inclement weather, such as high winds, fog, rain, and extreme heat or cold; striking or grounding on submerged objects, masses, debris, or land; being in close proximity to, including collisions with, other vessels/vehicles or structures; use of sharp objects, including knives, scissors, pliers, tools, hooks, lures and the like; being subjected to exhaustion, fatigue, and/or dehydration; and/or being subjected to equipment, vehicle or vessel failure (e.g. outboard motor, boat hull, pumps, trolling motor, batteries and electronic devices); yet, I willfully, knowingly, and voluntarily declare that I submit my person, equipment and vessel or vehicle to these conditions and assume any risk arising out of or as a result of my involvement in these circumstances. I agree to hold harmless GCTA, American Bank Center, Fox Yacht sales, SMG Management, City of Corpus Christi, and its agents, principals and assigns and indemnify them with regard to any loss or damage to property (including fish to be presented at weigh-in) or persons arising out of any circumstances presented while engaged in any act of participation in the EVENT, including, but not limited to, those acts during practice, captain’s meetings, tournament performance and while engaged in collateral/ ancillary activities of the EVENT. 3. That during the EVENT usage and maintenance of my boat/vessel, vehicle, instruments and equipment is my sole responsibility and that GCTA, American Bank Center, SMG Management, City of Corpus Christi, Fox Yacht Sales, and its principals, agents and assigns are in no way responsible for failure of my equipment or any action of mine or a third party which could result in damages or losses to my property (including fish to be presented at weigh-in) or person, or to those same damages or losses to a third person. I agree to hold harmless GCTA, American Bank Center, SMG Management, City of Corpus Christi, Fox Yacht Sales and its agents, principals and assigns, as well as indemnify them in the event of a claim regarding any loss or damage to property or person arising out of my usage or maintenance of my vessel, instruments and equipment in the EVENT. 4. That I further agree to generally indemnify, defend and hold GCTA, American Bank Center, SMG Management, City of Corpus Christi, Fox Yacht Sales and its agents, principals and assigns harmless from and against any and all liabilities, damages, losses, expenses, claims, demands, suits, fines, or judgments that include reasonable attorneys' fees, costs and expenses, incidental thereto, which may be suffered by, accrued against, charged to or recoverable from any party, by reason of any claim arising out of or relating to any act or error or omission, or misconduct of my agents or me during the EVENT, to the extent that the actions are not caused by an intentional act or gross negligence of GCTA, American Bank Center, SMG Management, City of Corpus Christi, Fox Yacht Sales and its agents, principals or assigns. In the instance that a third party has ANY claim against me and joins Coastal Bender Event, GCTA, American Bank Center, SMG Management, City of Corpus Christi, Fox Yacht Sales and its agents, principals or assigns, I have an obligation to defend said Coastal Bender Event, GCTA, American Bank Center, SMG Management, City of Corpus Christi, Fox Yacht Sales, and parties by providing for the attorney’s fees and costs of such defense. I acknowledge and approve, GCTA, American Bank Center, SMG Management, City of Corpus Christi, Fox Yacht Sales and its agents, principals and assigns to choose their own attorney in such instance, but I still have the obligation to assume and pay fees, costs and the like. 5. That I agree to waive any right to compensation or a claim against Coastal Bender Event, GCTA, American Bank Center, SMG Management, City of Corpus Christi, Fox Yacht Sales and its agents, principals, and assigns with regard to use of my likeness or appropriation, thereof, in any media format, whatsoever. I further agree to indemnify Coastal Bender Event, GCTA, American Bank Center, SMG Management, City of Corpus Christi, Fox Yacht Sales and its agents, principals, and assigns against any claim by a third party involving advertisement, sponsorship, or use of other marketing methods involving said third parties or their product or services. I further agree that any media, photographs, video, audio and the like that includes the likeness of me or my sponsorship, produced by Coastal Bender Event, GCTA, American Bank Center, SMG Management, City of Corpus Christi, Fox Yacht Sales and its agents, principals, and assigns is the sole property of GCTA, and I waive any right of compensation or ownership claim to said property. I acknowledge that Coastal Bender Event, GCTA, American Bank Center, SMG Management, City of Corpus Christi, Fox Yacht Sales and its agents, principals and assigns has absolute authority to use my likeness in any reasonable manner deemed appropriate by Coastal Bender Event, GCTA, American Bank Center, SMG Management, City of Corpus Christi, Fox Yacht Sales or its subordinates. 6. That in this agreement “indemnity” or any of its forms has the meaning of recompense for loss, damage, or injuries; restitution or reimbursement. I HEREBY ASSUME FULL RESPONSIBILITY FOR ANY RISK OF BODILY INJURY, DEATH OR PROPERTY DAMAGE arising out of or related to the EVENT(S) whether caused by the NEGLIGENCE OF Coastal Bender Event, GCTA, American Bank Center, SMG Management, City of Corpus Christi, Fox Yacht Sales and ITS AGENTS, PRINCIPALS OR ASSIGNS, or otherwise. I CERTIFY THAT I AM PHYSICALLY FIT AND OTHERWISE NOT MEDICALLY DISQUALIFIED OR AT RISK WHILE PARTICIPATING IN THESE EVENTS. I HEREBY RELEASE Coastal Bender Event, GCTA, American Bank Center, SMG Management, City of Corpus Christi, Fox Yacht Sales and ITS AGENTS, PRINCIPALS AND ASSIGNS FROM ALL LIABILITY FOR ANY AND ALL LOSS OR DAMAGE, AND ANY CLAIM OR DEMANDS THEREFROM ON ACCOUNT OF INJURY TO MY PERSON OR PROPERTY OR RESULTING IN MY INJURY OR DEATH ARISING OUT OF OR RELTED TO THE EVENT, WHETHER CAUSED BY THE NEGLIGENCE OF Coastal Bender Event, GCTA, American Bank Center, SMG Management, City of Corpus Christi, Fox Yacht Sales and ITS AGENTS, PRINCIPALS plus all tournament participants are required to sign this waiver absolving all tournament officials, officers, participants, sponsors and co-sponsors from any responsibility for damage or personal injury sustained as a result of the contestant’s participation in the tournament or its related activities, and the contestant’s signature on this form shall constitute in an alternate release in the instance the member fails to sign the official DECLARATION, WAIVER, RELEASE, AND HOLD HARMLESS AGREEMENT. I HAVE READ THIS RELEASE AND WAIVER OF LIABILITY, ASSUMPTION OF RISK AND INDEMNITY AGREEMENT, FULLY UNDERSTAND ITS TERMS, UNDERSTAND THAT I HAVE GIVEN UP SUBSTANTIAL RIGHTS BY SIGNING IT, AND HAVE SIGNED IT FREELY AND VOLUNTARILY WITHOUT ANY INDUCEMENT, ASSURANCE OR GUARANTY BEING MADE TO ME AND INTEND MY SIGNATURE TO BE A COMPLETED UNCONDITIONAL RELEASE OF ALL LIABILITY TO THE GREATEST EXTENT ALLOWED BY LAW. Your payment acts as your digital signature acknowledging and agreeing to all rules, regulations, waivers and consent which are found on this page above. Let GCTA host your next Tournament, Event or Charity so that you can focus on whats important and let us handle the rest. Contact Us Today to learn more about our Services! We have what your next Tournament or Event needs! Learn More About GCTA and our Services! © 2017 Gulf Coast Tournament Association. All Rights Reserved. Copyright © 2019 Gulf Coast Tournament Association. All Rights Reserved. Designed by JoomlArt.com. Joomla! is Free Software released under the GNU General Public License.